To the Team at Cable Chick !!! I am blown over with the products I've ordered. Absolute great in Every Respect I must say. Then ordered and within the blink of an Eye the goods arrived. Absolutely SUPER SERVICE and Quality. Will buy again--absolute---Not to forget (very nice touch ) -The Minties - Thanks again Guys. For quality gaming gear on a budget, E-Blue is the place to start for all your essential PC accessories. E-Blue have been in the game for over 12 years, expanding markets across the globe from New Zealand to Panama and from Taiwan to the UK. 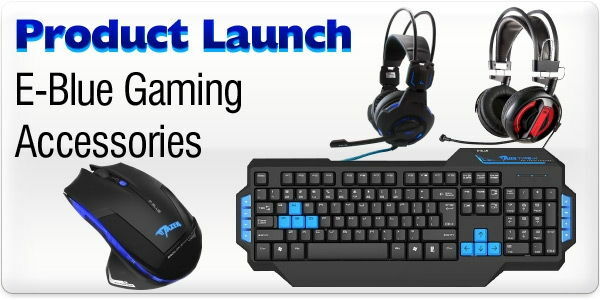 Until now, Australia has been all but left out of the E-Blue loop, but Cable Chick is now stocking a range of quality PC gaming essentials from the vast E-Blue catalogue, bringing their low-cost peripherals to one of the most demanding territories in the world. E-Blue's own R&D department, based in Osaka, Japan, develop their products for style and technical competency while keeping costs low, targeting gamers on a budget and delivering hardware which can stand the test of time. This fusion brought them the Marvel Iron Man 3 licence in 2013, leading to a themed keyboard, mouse and headset (that are a little too over-the-top for our needs!) This new-found attention has been great for E-Blue, with their future even brighter than before. Cable Chick have launched E-Blue on Australia's East Coast with a limited selection of E-Blue gear. We like to think of it as a best-of, offering products which are distinctly different from each other and cover the full spectrum of price points. The Mazer Type-R Wireless mouse is like the wired version, but without a cord to tether you. The Fresco-Pro is a compact wireless mouse perfect for travel and laptops. It lights up, but is more subdued than the other two. Mixing it with the big boys. We know the E-Blue name is new to us Aussies, with brands like Logitech and Razer dominating the gaming gear market thus far. We've chosen E-Blue as our flagship into the Gaming Peripherals arena because they're offering a price/performance balance which will make your wallet happy as well as improve your gaming experience. With technologies up to par with their competitors, like 2.4Ghz wireless micro dongles, blue-wave optical technology, adjustable polling rates and super-long life energy saving features on wireless products, you're getting a great product that can do the job without paying extra for features you don't use. Materials are also up to our high standard, with durable plastics, proven mechanics and lots of 'go-fast' lighting accents to make you the centre of attention either at home or when competing.